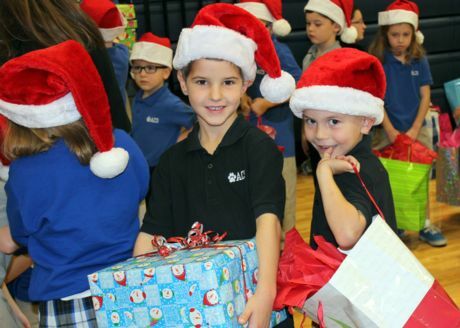 ACS partners with Betty Hardwick's Early Childhood Intervention Program which allows students of all ages to collect and deliver gifts that will bless families right before the Christmas holidays begin. For over 25 years the 5th Grade Students at Abilene Christian Schools have been delivering meals to individuals on the same Meals on Wheels route. Service project sponsored by Middle School students and a school-wide opportunity to donate clothes and canned goods to others in need. Those goods are then personally delivered by the school to Arrow Ford's Mission Thanksgiving event supporting Love and Care Ministries. Each year a secondary class coordinates a fundraiser to support and sponsor Francis, a young man who was formerly a trafficked child from Ghana, Africa. Francis was rescued out of the fishing industry on Lake Volta in June 2010. The money raised will provide Francis with everything he needs to live a healthy, happy life - food, clothing, tuition, books, school uniforms, housing and medical care. I Peter 4:10 - "Each of you should use whatever gift you have received to serve others, as faithful stewards of God's grace in it's various forms."